SYRACUSE — Democrat District 2 House of Representatives Candidate Mel Hall made a visit in Syracuse Wednesday afternoon, Sept. 12. Hall met with about a dozen area residents during a meet and greet at Mug Shots. 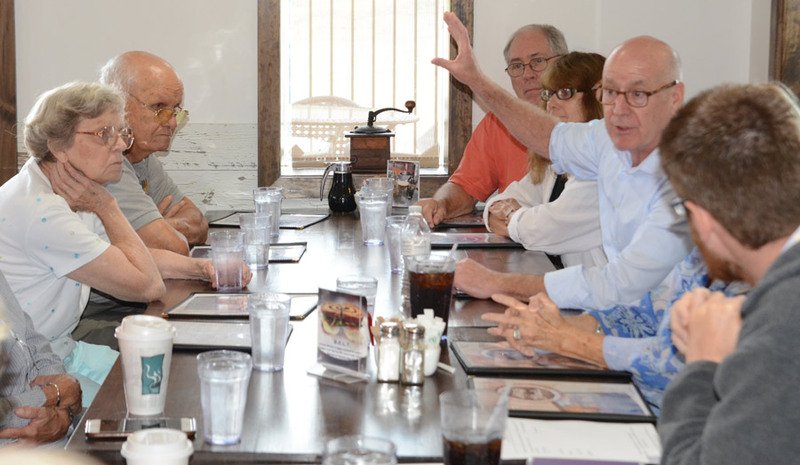 Hall has kicked off his Hardworking Hoosier Tour visiting various locations throughout the district during the past several days. Syracuse was his sixth stop Wednesday before traveling to Goshen, Elkhart and Walkerton. His visited lasted approximately 45 minutes. Hall suggested requiring elected officials hold a town hall meeting every quarter, submit reports whom they have spoke with and those who serve in congress not be allowed to be a lobbyist for five years after leaving office. He also stated bills with bipartisan support be presented to the floor immediately. “Elections matter and this election matters,” Hall stressed, again noting some of the problems with government are not Republican or Democrat issues, but governmental issues. Following Hall’s brief presentation he took questions and comments from those present. Among the questions were his thoughts on tariffs, retirement packages for members of Congress, taxpayers bailing out farmers and public education.